Now the business angle. About the same time Jean-Paul was pitching woo to his English girlfriend, the house of Guerlain was rethinking its business strategy. For a century the company had created fragrances it thought were pretty, and marketing played a backseat role. By the mid-1980s, perfume wasn't just a luxury item created by a handful of perfume houses anymore. The tidal wave of entities selling perfume that now includes car manufacturers, jewelers, country music stars, and even fast food restaurants was just cresting the horizon. Guerlain realized it had better draw up a new business model. Big, exotic perfumes were popular. Yves Saint Laurent Opium raced to the top of the charts in 1977, and Chanel Coco followed in 1984. Opium claimed the red-lacquered world of the Orient, and Coco snapped up Marco Polo's Venice. Guerlain decided to focus on India. For the first time, they created the concept for the perfume before the actual juice. Also for the first time, they opened up the creation of this new perfume, to be called Samsara, to outside perfumers. Jean-Paul entered his Englishwoman's perfume in the competition, and after two years and 300 perfume trials, it won. At last, in October 1989 — over five years after its last fragrance, Jardins de Bagatelle, came out — Guerlain released Samsara. 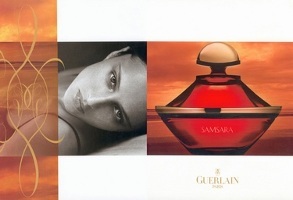 An industry periodical reported Guerlain planned to spend an unprecedented $50 million advertising it in magazines and television.2 Its intent was not only to sell Samsara, but to bring Guerlain back into the sights of perfume and cosmetics consumers. The TV commercial featured a model walking through a temple with Barbara Hendricks singing in the background. The fragrance's tagline was "a sense of serenity." Samsara has a top note of bergamot; heart notes of Indian jasmine, narcissus, rose, and ylang ylang; and a base of sandalwood, iris, tonka bean, and vanilla. Unlike Opium and Coco, it isn't spicy or resinous. Instead, it is warm and creamy, sweet and clean. Samsara's pairing of sandalwood (as much as 30%, Edwards writes) and jasmine smells so obvious, you have to wonder why it hadn't been done before. The almost syrupy sensuality of sandalwood can be cloying on its own. Similarly, jasmine can be sharp and demanding. In Samsara, sandalwood softens jasmine, while the jasmine gives the sandalwood light and movement. Ylang ylang adds to the floral creaminess, and a touch of vanilla and tonka remind you Samsara is, after all, a Guerlain. I detect what I think is a touch of white musk in Samsara, too, adding a little soapy skin to its dry down. Samsara is often — undeservedly, in my opinion — tarred with the same brush as some 1980s bombastic perfumes. Samsara is distinctive, true. Like Guerlain Shalimar or Chanel No. 5, you know it when you smell it. But I don't find it overly loud or demanding, especially the Eau de Toilette. (The Eau de Parfum has more sillage and a greater emphasis on the sandalwood.) It blends well with my body chemistry instead of sitting on my skin radiating berries, patchouli, and cheap musk like some perfumes do. I don't find it hard to wear, just very Samsara. Samsara may not be fashionable right now, but if you can, try it with a fresh nose. It might be just the thing for a crisp, fall day. Guerlain Samsara comes in extrait, Eau de Parfum, Eau de Toilette, body lotion, shower gel, body cream, and spray deodorant. For information about where to buy Samsara, see Guerlain under Perfume Houses. 2. Cosmetics International, July 25, 1989. Hi Angela – I really enjoyed this review, especially the history/makig of Samsara. My younger sister wore this when it came out (yes, back in the day when high school girls had elegant non-fruit-salad aspirations! ), so I always associate it with her. She wore it well into her 20s and I think she probably still has an old bottle laying around. Samsara doesn’t wear well on me for some reason (regardless of how often I test it), but perhaps it is just that it’s my sister’s fragrance. It is rather striking though and I think it smells wonderful on other people! Anyways, I was a Coco girl as you know. Samsara is so purely itself, that I can see if you knew someone who wore it, you would always associate it with her. It’s really distinctive. I’m kind of a Coco girl myself! An interesting read, as usual, Angela. The comment about pairing jasmine and sandalwood suggests a question: is Samsara in any way like Patou’s 1000? Is there patchouli in 1000? I’d no idea. Samsara must be the smell of absolute beatitude if 1000 smells darker in comparison. Must try it . There’s definitely patch in 1000, although 1000 is about as far away from hippie-smelling as a perfume can get! I’d love to know what you think of Samsara. Five years between releases! Imagine! I’m not actually familiar with Samsara. Any thoughts on the current formulation? I’m guessing the sandalwood part might have suffered? I know! I was amazed, too! I’ve heard that the sandalwood is the big difference between the current and original formulations. Apparently the original had lots of Mysore sandalwood plus a sandalwood-smelling chemical. Susan Irwin wrote Guerlain even purchased their own plantation to ensure they had plenty of it. Now that Mysore sandalwood is hard/impossible to get, something had to change I guess. I was an SA back in the early 90’s and had bottles of both of the Edp and Edt. The Sandalwood/Jasmine combo was lovely (though in the Florida heat and humidity, I preferred the edt formulation). To me, the newer version does not have as much depth, and it may be my chemistry, but gets a little sweeter too. I loved the jasmine in the vintage because it “greened” it up a bit. It also was verrry long lasting, one spritz lasted for most of the day. I wish I’d kept my bottles because the SF climate is perfect for Samsara. I can imagine Samsara would be much better in San Francisco than Florida! I haven’t tried the reformulated Samsara. I was given a sample of the edp while shopping for a father’s day gift in 1990 and was told it was the newest release they’d received. I was not a fan back then though it smelled completely unique. I formally became acquainted with Guerlain about 5 yrs later and I don’t know if there were any other major releases between Samsara and Champs Elysees (except Un Air de S), but every Guerlain GWP came with either a Shalimar or Samsara set of edp, bath gel, and lotion/powder. I loved the bath products but never wore the fragrance (gave them all away – silly me) because it was so distinctly recognizable and too many other women I knew (favorably or otherwise) already wore it. Much older and far more mature and experience – scentwise, I think it’s both beautiful and masterful. Thanks for the review, Angela! BTW, Angela – which version is your writeup based on? I have a bottle of EdT I bought at a discount store a few years ago. It isn’t the very latest formulation, but it’s definitely newer than the original. It really is distinctive, and that’s part of Samsara’s genius and its drawbacks. It’s like Shalimar that way. I would love to try a dab of it! I can’t even imagine how lush it must smell. Wow, that sounds good. I have to admit, I’ve never really loved a Guerlain perfume. I know, it’s almost tragic for a girl who loves perfume. But maybe Samsara will be the one. No Guerlains? Not Apres L’Ondee or even one of the Aqua Allegorias? Samsara is worth a try, as a reference perfume if nothing else. This will prompt me to test this fragrance again. As much as I want to love Samsara, and on paper it certainly looks like I should, alas, it just hasn’t worked for me. I’ve only tried the newer formulations – would love to get my hands on some vintage. Great review, Angela – I love backstories! Samsara is so Samsara, that if you don’t like it you may never like it–you know what I mean? I don’t know if it would matter if you tried new or old. I’ve come to love Samsara. Does anyone know when Samsara stopped being made in the clear bottles? I thought it always came in red bottles–but I’m no expert. The EDT and EDP come in clear bottles. The extrait comes in the red glass. There was a red plastic refillable container for EDP at one time. Un Air de Samsara (frosty bottle) was my favourite for a long time but now that my perfume knowledge and tastes have matured fifteen years later, I find it a bit too sweet. Thank you! My EdT is in a red bottle, so maybe it’s earlier packaging?I know Guerlain changed the packaging of a number of its fragrances recently. Having checked my Guerlain “textbook” of bottles, my previous comment stands up. The only thing I can think of is that there was a limited edition bottle called “Silk Road” circa 2001 or 2002. It was red glass with gold stylised maps of the Orient routes. It was the shape of the regular bottles, and there was also one called “Perfumed Dew” that was tallish and skinny in rollerball style. I’m so jealous of your Guerlain textbook! My bottle is definitely red glass–not opaque, but a sort of clear red with gold trim and a red, translucent plastic cap. It’s a 1.7 ml EdT with “6K01” on the bottom, along with the usual Parisian address and “made in France”. Maybe it was the special edition. I don’t have the box it came in anymore, darn it. Interesting! Here in UK, at least, it comes in red bottles or in see-through refills for those gold canisters. See http://www.escentual.com or http://www.debenhams.com for examples. Angela: sorry, my brain has finally become engaged. Here’s what I have realised: around 2000, the company started to change over some of their fragrances to EDT and EDP bottles that closely reflected the extract bottles. (However, that was when Shalimar went from the striated EDC, EDT, and EDP to the modern bottle that emulates the label.) Samsara, Mitsouko, Champs-Elysees, L’Instant de Guerlain, Insolence, and L’Heure Bleue are in bottles that look like the pure perfume, even though some are elongated for the quantity of juice in them. My book is “Guerlain: Perfume Bottles Since 1928”. It ends at 1995 so the latest bottles are not listed. Thanks for the update! I love all your expertise about Guerlain. You’re right–my EdT bottle looks a lot like the parfum bottle, and come to think of it, my L’Heure Bleue and Mitsouko EdP bottles look just like the parfum bottles for them, too. I hadn’t thought about that before. Samsara was my first adult perfume purchase. I was 22 and bungalow sitting for my grandparents in their retirement community in Delray Beach, FL while they took a month long trip. I bought the EDT at the mall after deciding I needed something “grownup” that didn’t come from the drugstore – previously I was very faithful to my Exclamation!, Jovan White Musk and Love’s Babysoft Lemon (it was the 90’s and I’m from Ohio). I loved the scent because it was floral, seductive and sweet but not “old” – my grandmother bathed in Pavlova, Shalimar and Arpege and that was my benchmark at the time for adult perfume. When I wore Samsara I felt sophisticated, smarter and possibly thinner – and definitely not from Ohio. I wore that perfume to every early bird special dinner in town – my grandparents friends were nothing if not determined to watch out for me – and everyone commented on how nice I smelled. I haven’t worn it since because it was part of a defining portion of my life and doesn’t suit me anymore. What a thrill it was at the time! Great story! Love the part about the early bird specials – hee hee. To this day I cannot watch the Seinfeld reruns of Jerry’s parents in Florida without cringing – especially the astronaut pen episode. It isn’t fiction, I LIVED IT! The neighbor who was convinced that Viagra was making all the senior men targets for loose young women and thus spreading Aids through the senior community. Another neighbor had redecorated their bungalow in hunter green, burgundy and various plaids with hot pink cabbage roses everywhere and really low lighting (I fell over their dog twice) was insulted that it wasn’t included on a local “senior home style” show since it didn’t reflect Florida colors. The list goes on and on . . .
That sounds like a TV show of its own! Yes, what a wonderful story! I too have a fragrance or two that are too much “my past” to be part of my present now, but what memories! Fabulous story and great details! Samsara plays a big role for you. What a wonderful story! Thank you for sharing it. Sometimes I think it would be very interesting to put together a collection of “scent memories” like this, wouldn’t it? I know I’d definitely read it. My Dad bought me both Jardins de Bagatelle and Samsara – he was my perfume pusher for many years, because usually what smelled good on him would also smell good on me. I always felt that the two were somewhat similar, but I need to re-visit. I always liked them both. It can be hard to go back to perfumes for me sometimes – I have only done it successfully with l’Heure Bleue so far. My Guerlain collection is growing bit by bit! Just bought Apres l’Ondee and am starting to fall for Attrape Coeur. I’d be interested to know if you still find Jardins and Samsara similar–they seem so different to me, but I haven’t smelled them side by side, and you must smell a common thread! Great additions to your perfume collection, by the way. I’m in the process of falling for Attrape Coeur too. It’s a well named fragrance! Wonderful review! I always enjoy learning the story behind the fragrance. I’m a huge Guerlain fan and sandalwood is one of my favorite notes so I can’t believe I’ve never sniffed Samsara. The jasmine scares me a bit though as it can be difficult for me. I’ll make a point of testing this the next time I run across a bottle. It’s definitely worth a try. The jasmine really does transform against all that sandalwood. Guerlain has cast a spell on me. I used to think I could dismiss most of the classics and I was sure I would never be a G girl: based on the blotters I sprayed and sniffed, I use to allow on skin, and enjoy, Jicky only. Just last weekend I grew bold and tried Chamade on skin, after “bleahing” at the smell of the cap and blotters. I was blown away. After an hour or so of wear, I reached perfume Nirvana. I now want bottles of all the above, in extrait concentration please, and I know I just can’t have them all… This is a very dangerous situation, wallet-wise. I see just a cure: looking for minis on an auction site! Oh no! It’s time to start playing the lottery. The Guerlains are so often so much better in extrait, too. I feel for you. I bought my first bottle of Samsara around 1994 or 95. I was 25 yrs. old. I loved it and I still do. I do not like the current formulation of the EdP but I am thrilled with the current extrait and wear it every now and then and love to wear it mostly in the fall and winter months here in So. Calif.
Another jasmine and sandalwood combo that is brilliant is OIRO from Mona di Orio. Different from Samsara but worth a mention. Thanks for the recommendation! I’m even more eager to smell Samsara in parfum now. Dawn: I can see what you’re saying about Oiro. I got a small decant recently — that’s a beautiful, rich scent, and the sandalwood is even deeper somehow, but yes, I see a connection (I had to put on a bit just now… lovely). I must have a sample of Oiro around somewhere–must find it! You’re right–it’s hard even to catch up with the classics! Angela–your review prompted me to dig out my mini of Samsara EdP. It was part of one of those GWPs back in the late 90’s, and had been languishing totally neglected since then. I had dabbed a bit once or twice as had dismissed it as “not me”. Smelling it now, it is somehow different from what I remember–less “in your face” so to speak. I am about thirty minutes of so into it, and I am perceiving Samsara as more of a rich floral than anything else. The jasmine is quite present, but I do get a bit of a green angle to it. Many jasmine-heavy frags can give me a headache, but I think that overdose of sandalwood keeps it from being too heady. I still don’t think it is quite right for hot muggy weather. Perhaps I should try it again when it cools off a bit, say around mid-November (LOL). I think it would make a nice fall/winter scent. I think people assume Samsara is just another take on Opium, but as your description implies, that’s so far from the truth. Oh, I don’t think it is anything like Opium. I have never actually worn Opium, but I have tested it once or twice, and I thought it smelled as if someone had emptied the contents of an entire spice cabinet into the bottle. I like a little spice in a perfume, but Opium was just too much. I don’t detect even a hint of spice in Samsara. I can see that it might be too rich for some tastes, but I am finding it far less aggressive than other 80’s scents (anyone for Giorgio or Poison?) . It is also a far cry from the fruit salad that has taken over the department store counters during the last 15 or 20 years. Whoops! I think my comment sounded like the *opposite* of what I wanted to say. (Always the disadvantage of writing.) What I wanted to say is that, as you pointed out, Samsara and Opium aren’t the same, loud, spicy thing at all. Hi 50_R – I actually think that the jasmin + sandalwood combination is ideal for the summer, after all, they are very much part of the Indian culture, where it’s hot and sticky mostly year-round. Of course, I also wore Andy Tauer’s Incense Rose this past weekend, where our NJ temperature was up in the ’90s…. Stay cool where you are! The temperatures out there are getting dangerously high. I particularly enjoyed hearing the backstory – thanks, Angela. I have yet to smell Samsara. I have the occasional difficulty with jasmine – but perhaps should see if I can hunt up a sample somewhere. Ugh, Samsara smells like belly button to me. I assume it’s the sandalwood? Belly button! You hang out with some fragrant-poitrined folk! I’m not sure if what you’re smelling is the sandalwood or the combo of the floral bits and sandalwood. Or maybe the musk? Thanks so much for this review, Angela. A couple months back, I was able to get a ca. 1993 tester of EdT for next to nothing via a split group. I didn’t do — and haven’t done — much research about the scent, and as with 24 Faubourg, I would have guessed Samsara to be older than it is. However, you’re right when you say Samsara is not overly loud or demanding (not like Coco or Opium, for sure). When I’ve worn it (rarely), it’s almost like a background scent: pretty, not excessively feminine to my nose, and providing more of a barely perceptible mood than an obvious “scent experience.” It (at least the EdT) is not a bombastic 80s fragrance to me. I’d be curious to try some vintage EdP or extrait; I assume the formula has changed in the last twenty years due to the sandalwood situation. Any comments on the current product and whether it is a mere ghost of its former glory? Also, I wonder how it fared; do you know if it was a big seller for Guerlain, or a disappointment? [I broke the server when I tried to add an addendum to my comment earlier… lol] I realized I had a sample vial of EdP here so I pulled that out and tried it on one hand; definitely richer, but still settles down to a lovely and somewhat quiet scent I think. My skin really eats the EdT. I thought I broke the server when I tried to respond to your original comment! Thanks for the comparison. I’m not sure, really, how the latest incarnation of Samsara matches the original formula, but I assume because of the sandalwood it’s not as rich. Still, I feel like it must still be recognizably Samsara. I’m guessing Samsara has done well for Guerlain because they’re still offering it in so many formulations–body cream, shower gel, etc. Of course, in my world I wish they would offer Vol de Nuit in as many forumulations! I see Samsara perfume (not necessarily the body products) all over the place, from the high end stores down to the pharmacies – those pharmacies that stuff and cram all the celebrity scents, the Red Doors, tbe 5th Avenues, the Giorgios, the Cool Waters etc into horrible bright, hot cabinets. In among all that there is likely to be a Samsara. Although Samsara is not one of my faves, I always feel sorry for it and wish I could rescue it each time. Like wanting to take neglected cats home. That’s so funny! I can imagine the poor little bottle of Samsara, forced to rub shoulders with a slatternly bottle of Red Door. I bought the EDP when it was launched in 1989, and also a jar of the body cream, which was different from the EDP but not in the usual way: ordinarily, a cream is going to damp down the top notes and be heavy on the base notes, but the Samsara cream was much brighter and sharper than the liquid scent. I can still call to mind the smell of it! In fact, I haven’t smelled Samsara in at least ten years, because I know it’s been changed and I’m afraid they’ve ruined it; I think I’d rather live with my memory of it, besides which I have a zillion other scents. But oh, it used to be so good. That’s so interesting about the body cream being lighter! If you really loved Samsara, it’s probably worth trying again. You never know–maybe it will bring back good memories. Interesting review, Angela! I’m one of those people who dismissed Samsara (I must have tried it) along with Opium (I KNOW I tried it) way back when. Those big ol’ orientals just weren’t my style. However (go figure) I fell for Boucheron and have stuck with it all these years. Would you say that Samsara is in the same family of fragrances as Boucheron? I need to give it a try, I guess. The only Guerlains that have truly felt right on me, so far, are Chamade (sigh…) and Terracotta Voile d’Ete (skin scent extraordinaire). I’d say it’s definitely in the same family as Boucheron, but not as loud or spicy. Samsara is so particularly, so Samsara, that it’s hard to compare it to anything. You might like it, though! Thanks! I will put it on my “to test” list. You never know when you might find a new fragrance to love! Oh good heavens – there mist be something WRONG with me – help!! I find Samara very loud, strong and rather synthetic, whereas to me Coco is (relatively) gentle and easy. Opium is somewhere in between. My Samsar is the EDP, a red bottle bought in about 2005. I persevered for quite a while before consigning it to the cupbarad. I’ll get it out again for another go … because there are notes in there that I do like. Never apologize about the typing–mine is always off kilter. I’m sure there’s nothing wrong with you! I can understand the “synthetic” part, although to me it isn’t so much chemical-synthetic smelling as it is that singular blend that makes up Samsara. It’s a bit odd and very particular. I can completely understand trying it, then deciding it’s not your thing! Thanks, worth trying again then. I have so much enjoyed reading otehr people’s reactions. Annemarie – You are definitely not alone. I, too, find it quite loud – when I detect it on others (since I don’t wear it myself). That may very well be that many people tend to use the EDT and spray generously. Fortunately I do not find it unpleasant, just BIG. Well done, Angela. This is a perfect example of why I love this place so much, you literally can learn something every day, whether revisiting classics or exploring something new. Samsara was one of the first perfumes my husband bought me back in the 80’s-I love it and always have a bottle of EDP I can use- the smell has changed since the 80’s and my husband no longer likes me to wear it, it gives him hayfever, so I cant wear it often. Im just off to spray some on now! Hayfever! That’s not good. I hope your husband doesn’t end up sneezing tonight! I sprayed a very small amount on the back of my hand so I can secretly sniff and not make husband or son sneeze. Great perfume and a great review. I really like the EdT. The parfum and EdP are a little too sweet and fruity actually… Even a little plasticky. I think it’s magnificent in the summer too. I’m glad you like the review! We have some warm days coming up, I’ll get out my bottle of Samsara and give it a try. Yes, do! I find that sandalwood has a “cooling” effect. See my remark about India above in reply to 50-Roses. I saw it–my bottle of Samsara is at the ready! Tomorrow the temp is supposed to hit the 90s. Also wanted to add – it is one of the very few perfume bottles that I emptied in my life. It must mean something, right? Has anyone tried the Samsara Shine? I see it on some of the online discounters and am tempted to buy it unsniffed. I haven’t tried it, no. I’d be curious to see what other people think who have tried it. If you like fig in a fragrance, you would probably like it. Fig is really popular these days, it seems. Sounds like it’s worth a try. So last year my mother pulled from storage quite a few vintage bottles of Nahema, right? Right there in the box was a bottle of Samsara EDT, which I was less excited about, even though I knew it had gone through a huge change. I wouldn’t say I hate it–indeed, retesting it today showed me that it can be just what the doctor ordered–but it is big, loud, and sticks to its guns until it gasps its last. I sprayed some on maybe 1 pm-ish? It’s 2:45 am (which is alarming but I had things to do) and it’s still knocking me out with sillage. I’m still not sure I pick up any jasmine but it does smell beautiful: perfectly coiffed and just slightly dirty. If I was doing a “family tree” comparison, it would definitely be Timbuktu’s married-rich little sister. Now, the box from my bottle clearly says “Copyright 1988” which I would think means it’s from 1988. It was launched in 1989, though, right? Maybe it was released early in Paris. I don’t know how it happened but in the late 80’s, every year my dad went to Paris and brought home a Nahema for my mom. I guess one year he got talked into Samsara. Judging from how brand-new it looked, I’m guessing my mother didn’t take to it. And my bottle’s clear and kind of tall with a red/black/gold cap. Anyway, I’m interested to hear that you find Samsara so loud and long-lasting. And that’s just the EDT right? Stories like this scare me. I get scared that something I find “barely there” might be asphyxiating everyone on the bus. Because… seriously… the Samsara edt I have I can barely smell with moderate application. Wow! I wonder if Samsara has been toned down over the years? The packaging may have been created before the perfume launched, which would explain the earlier copyright. I’m still green with envy when I hear about all the Nahema you have stashed away. And an old bottle of Samsara, too! I have an on-again, off-again relationship with Smsara. Hve an old mini EDP that is much better than the new EDP. P.S. –Sorry– my “a’ keep was sticking (above). I can imagine “on again off again” with Samsara. It’s so particular, it could be like having an occasional enthusiasm for banana cream pie, or something like that, then getting sick of it for another year. I really can’t quite remember what this smells like — I tested it in a duty free shop in Narita, but unbeknownst to me I was coming down with something akin to the plague which hit me one hour into an eleven hour flight so I probably couldn’t smell it properly anyway. But the sandalwood has me intrigued. I’ve been searching for a good sandalwood and had high hopes for Narcisse Noir but unfortunately while I like it better than I initially did, it still hasn’t wowed me. There is lots of sandalwood in Samsara, but somehow it doesn’t smell much like pure sandalwood, thanks to all the jasmine, I guess. I hope smelling it doesn’t bring back feelings of the plague! Thank you for the lovely review. As you note, Guerlain spent a lot for Samsara’s debut: in Boston, where I lived at the time, they paid for a small parade through Downtown Crossing (the area around the two major department stores in the center of town), with exotically caparisoned elephants and women wearing Indian dress. The handed out samples to everyone who watched the parade. I wish I still had the sample! I expected Samsara to be spicier than it was, and I didn’t buy it because it was too sweet for me at the time. Wow! If they had a parade in Boston, they must have had events like that all over. That’s pretty amazing. Oh, the eighties. I loved Opium then. Also Eau de Givenchy, which seems to have been reformulated, because now it smells much sweeter. Poison was verrrry popular in Athens, where I was living at the time – you could walk down the streets in Kolonaki (the fancy part of town) and be enveloped in sudden clouds of that aptly named scent. (Greeks are not known for their subtlety.) It always reminded me of PigPen from Charlie Brown, the character with the cloud of dust that followed him from place to place. Samara has never worked for me, although I am a Guerlain girl for sure. But you make it sound so lovely that I’m thinking I should give it another chance….. I love your image of fancy girls in the fancy part of town as Poison-trailing Pigpens! You know, if you don’t like Samsara, you may never like it. Still, if you can’t remember it all that clearly, maybe another sniff is in order! I remember the launch of Samsara in London. *Everyone* was wearing it and it was instantly recognizable. It was lovely and I might have worn it, had it not been so ubiquitous. I haven’t sniffed it since then. I believe it’s not as good as it used to be. It really is singular, and I can imagine how that would be a problem in the years after it launched. Now, though, I don’t smell it around much. Of course, as you say, now the sandalwood isn’t the same. But it still smells good! In an extreme fit of impulsiveness, I bid on and won (of course!) some 90’s Samsara edp. I was furious with myself after winning as I wasn’t in love with my decant from TPC. But the bottle of edp (clear bottle, which did preceed the red glass) is beautiful and has become one of my very favorite perfumes. The decant, which must be a newer reformulation, was very similar (certainly not a pale imitation) except for a violet note that I’m assuming comes from the ionones used to replace the sandalwood. I don’t like that note and of course, my skin amps it, but others may not find it offensive at all. I always love your reviews of the classics, Angela. Thanks! All the benchmarks of a classic story: first the hope (will I win? ), then the disappointment (but I don’t want to win, because I don’t even like my decant), then the happy ending (Samsara, lovely!). All in a couple of sentences. Brilliant! I’m glad you have a bottle that works for you! I was lucky enough to go in on a split of vintage Samsara edt and it’s fabulous – I love it much more than the edp and definitely more than the reformulation. Fortunately, like my other vintage love Emeraude, the vintage edt can be found fairly easily and cheaply. Hurray! It’s so nice to love something that’s actually reasonably easy to find. I ordered a sample of Samsara edt from the perfume court the other day, and it just came this afternoon. It’s even better than I expected after reading this interesting review. To my nose, it smells creamy and woodsy, with the sweet jasmine accent rising up like soft smoke. It also has an effect rather like smoke, in that it sort of “emanates” from your skin. I can see why people crossed the street to ask what Jean-Paul’s “Englishwoman” was wearing. I’m glad I got a chance to try it! I’m so glad you got the chance to try it! It really is a one-of-a-kind fragrance. Sandalwood almost always reads as “soapy” to my nose, so perhaps that’s why I find Samsara’s drydown rather bathtime-ish. I actually do think it’s spicy, but agree that it lacks the syrupy, resinous quality that makes the likes of Opium and Coco thicker than wet carpet. Samsara is comparatively stark, dry, and powdery – a little too powdery for my taste, particularly the eau de toilette (which borders on Red Door territory – ie. cheap woody/powdery ’80s oriental, but perhaps that’s just me). I have yet to smell the EdP or parfum but suspect that I’d enjoy them more. One thing your review didn’t mention is Samsara’s otherworldly tenacity. I gave my wrist one spritz of the EdT at a department store today, and after several hours and multiple hand washes, I can still smell it. They don’t make EdT’s like they used to, apparently! I wonder if you had sandalwood-scented soap when you were growing up? I know I can’t smell orange blossom without thinking of soap. And yes, Samsara sure does stick around! Thanks for the mini-review! Purchased Samsara Eau de Parfum 100ml spray £96.00 recently from John Lewis I cried a river ! it`s a watered down version..
Oh, I’m sorry! I know how disappointing that can be. I encountered a Guerlain store at the Venetian in Las Vegas this weekend where I stayed. Yay. I spent about an hour there. I only have Shalimar (my love) and a small decant of L’Heure Bleu so wanted to sample as much as possible. I thought I would love Samsara based on reviews but it dried so sweet on me that I did not love it. It’s great, though, that you had the chance to sample it–and some other Guerlains!